Coloring Without Borders: ⅓ Scottish ??? He has spent one third of his life in Scotland. Actually, our one-year anniversary of moving to Scotland is this coming Friday, but close enough. Does that make him ⅓ Scottish? Last July, with his cousins Garrick and Macie on the Old Course in St. Andrews. A few weeks ago. He definitely has grown taller (7 inches, by my measurement) and leaner in the last year. No wee Scottish accent. Not yet inured to rain. Hasn't developed a taste for whisky. Golf swing needs work. No kilt. Jack spends almost all his time with me. And with Kate. He's not getting any Scottishness from us. He does get to play with Scottish kids in playgroups and in the neighborhood. But those are just for a couple of hours at a time. Our next door neighbors on both sides are Scottish, and with warmer weather we talk with them a fair bit as we work/play in the yard and eat some dinners al fresco. Overwhelmingly, however, his influences are American. His lack of immersion feels a bit like a failure to me. We work hard to be expats who embrace the culture and get to know the natives. Although we like having fellow expat friends, we want to make sure they don't eclipse some of the main reasons for moving abroad: broadened perspectives, learning new cultures, assimilating into a country. We need to work to make sure Jackson is on track to do so. Celebrating his second birthday in North Carolina with best friend Nicholas. A few days into our move to Scotland. And we will, I think, over the coming year. We aim to get Jackson into at least some part time nursery/day care, where he will be immersed in Scottish adults and kids. And as he now starts heading into an age when kids actually play together rather than just beside each other, he'll get the start of a peer group. Peer groups and schooling -- that's how he'll become more Scottish. Before moving here, I thought spending ⅓ of his life in Scotland sounded like it would make a deep influence on his development. Not so far. But this next year will mean he'll have spent half his life in Scotland, and more of it will be spent with actual Scots. Jackson has already declared he wants to be Gonzo for Halloween. Those worries are for another time. Today is a day to celebrate Jackson. Happy third birthday, Jack! 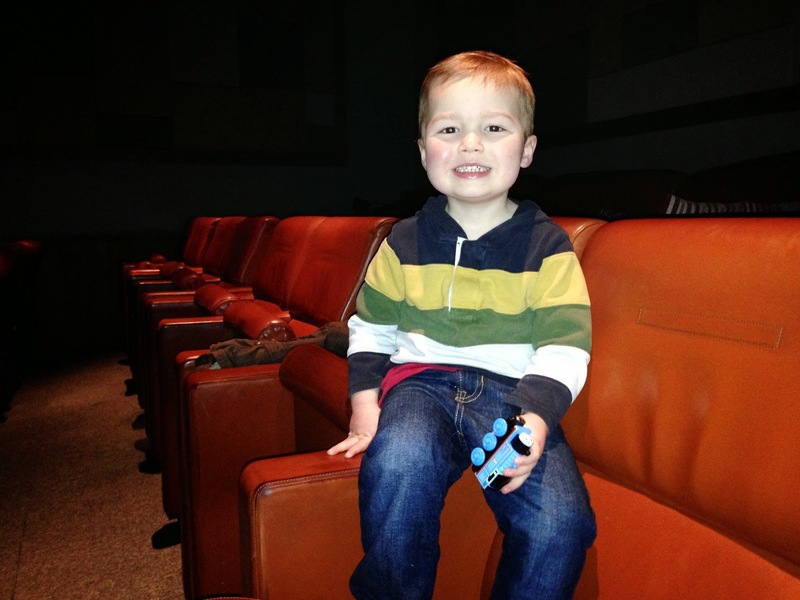 Waiting for a toddler movie in the classic Grosvenor Cinema in Glasgow's west end.